Not a good start. Two batters, two hits. I sent out just two requests lately but one came back very quickly. 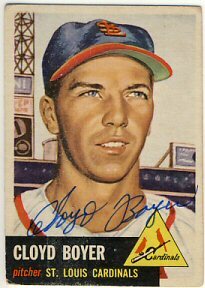 I sent a 1953 Topps to Cloyd Boyer just 5 days ago and I received it back today. 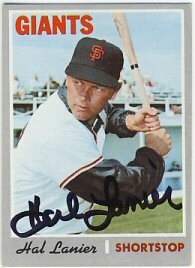 I realized there are still quite a few good signers from this set that I don't have yet so I'm going to try to get a few more of these signed assuming I can find some affordable cards. I don't go to a lot of garage sales but maybe I should. Today my boys and I stopped at one while we were running errands. 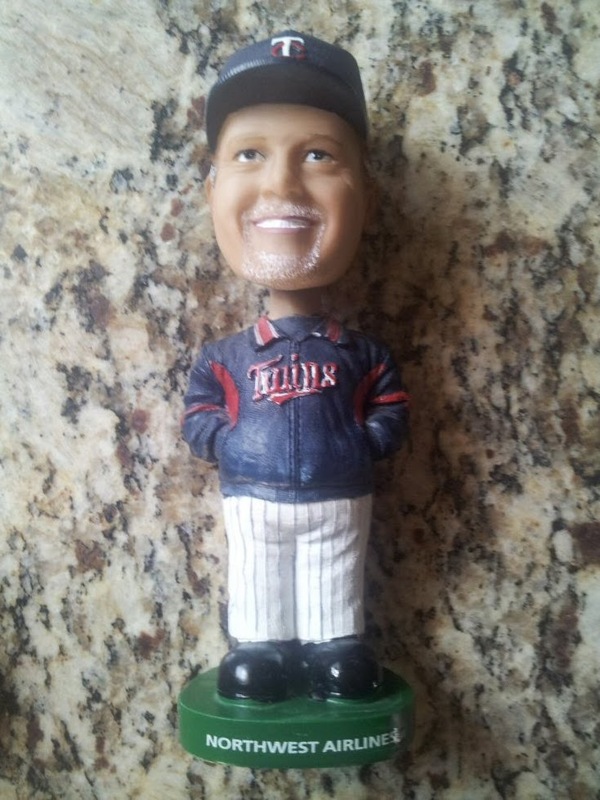 I bought a Ron Gardenhire stadium giveaway bobblehead for $2. No card with it though. I already have this bobblehead but I haven't gotten it signed for some reason. 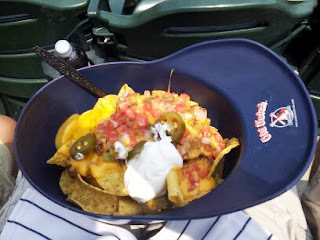 I'll have to remember to take it along to TwinsFest next year. My sister and her family gave me an eBay gift certificate for my birthday. It didn't take me long to spend it! 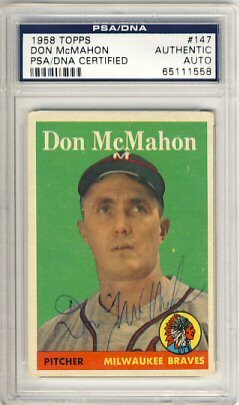 I bought a 1958 Topps signed by Don McMahon and authenticated by PSA. This brings my 1958 set total to 364. Just 130 more to go! Not a great game. 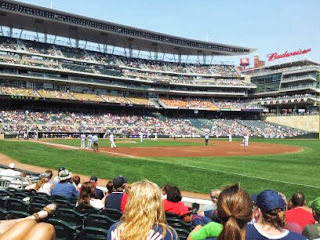 The Twins didn't hit much and Gibson gave up too many hits and runs early. The weather was nice though. We didn't get any autographs but didn't try too hard. I saw one or two guys signing briefly. without a helmet full of nachos. 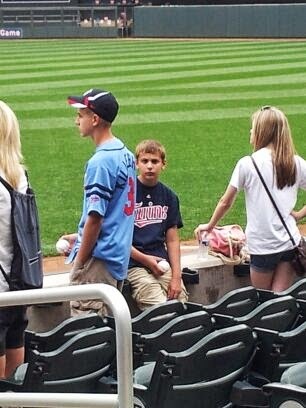 We're at the Twins/Mets game today. We're a little early, hoping for some autographs. I'm a little late posting this but I didn't have time at the end of last week to post before leaving town. 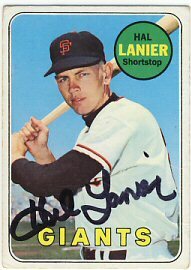 On Thursday I received a nice return from Hal Lanier, who signed his 1969, 1970 and 1972 Topps. 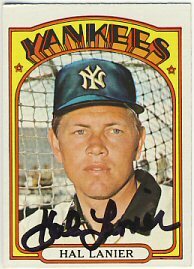 One more '72 Topps for my set (which has a LONG way to go). It's been a long time since I added a 1965 Topps to my set. 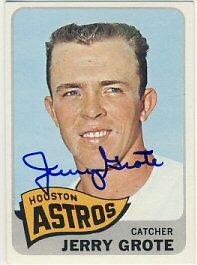 Today I received one back from a mail-in signing with Jerry Grote. There's a card show this weekend but I won't be able to make it. I guess I'll have to wait until September to hit the next show and get some more cards to send out. Another return today from the small batch I sent out a little over a week ago. 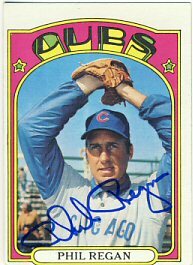 Phil Regan signed a 1972 Topps for my set that I sent to him in care of the St. Lucie Mets, where he is the pitching coach.